Peace Corps volunteers (PCVs) and FLEX alumni have been collaborating ever since the FLEX program began 25 years ago. 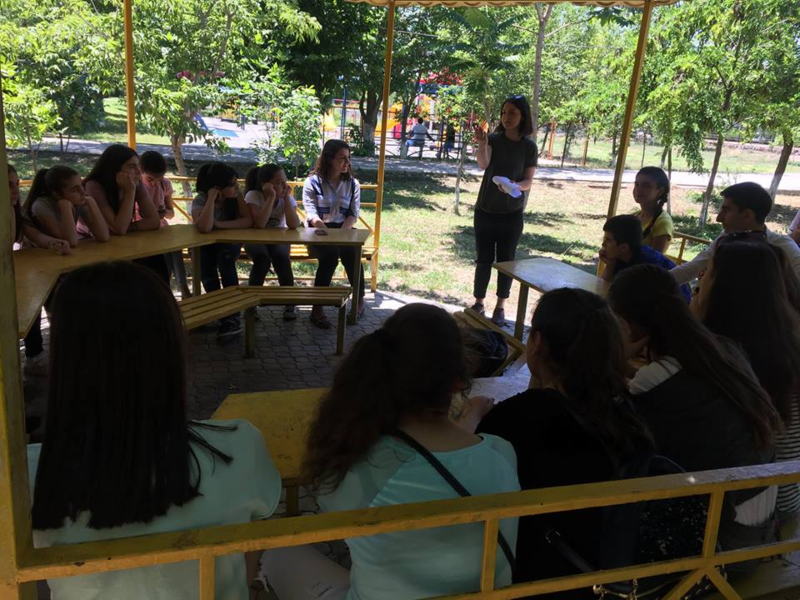 For years, Peace Corps volunteers have been implementing an environmental camp called Growing and Renewing Our World Camp 2018 (GROW) which aims to tackle environmental issues in Armenia. The camp takes place all over Armenia and each year over 100 students participate. The interactive classes involve games, experiments, teambuilding activities, and discussions. 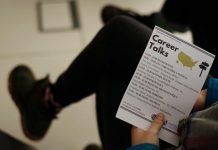 Because of language barrier between PCVs and the participants, Peace Corps invited FLEX alumni to take part in organizing the camps this year. Darryl Alexander invited Elmira Ayvazyan ‘15 (Echmiadzin, Armenia/ Burleson, TX) to join the team organizing the camp. Being the environment enthusiast that she is, Elmira immediately agreed. 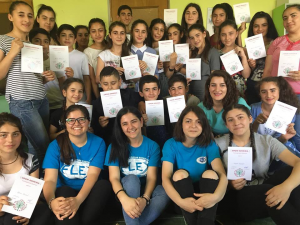 This year, the GROW camp will take place in four cities in Armenia – Alaverdi, Sevan and Gavar with the first camp in Armavir already successfully implemented. 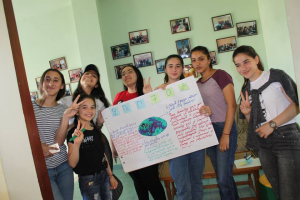 On June 9, Elmira and alumnae Lilit Ghandilyan ‘17 (Armavir, Armenia/Palmyra, VA) and Anna Andreasyan ’18 (Armavir, Armenia/ Runnells, IA), implemented the first GROW camp in Armavir for 34 middle school and high school-aged students. Arman Azizyan ’11 (Armavir, Armenia/ Sturgis, MI), the founder of the Armavir Development Center, provided the space for the camp. The main topics of the classes this year were deforestation, water pollution, climate change, and waste management and focused on what young people in Armenia can do to help with these problems. 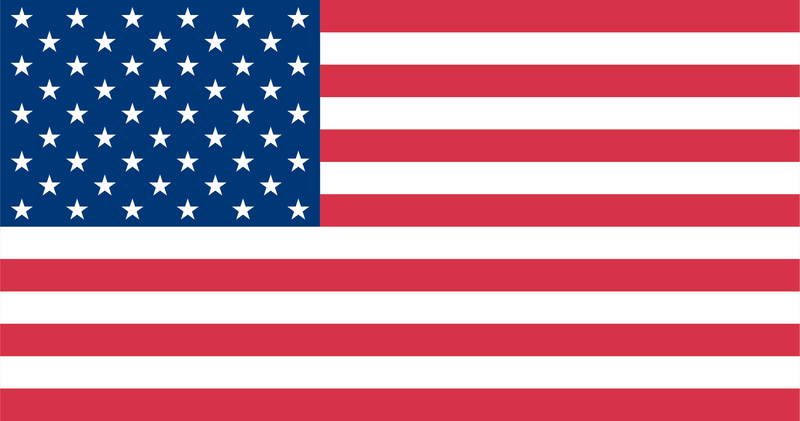 Environmental sustainability is one of the most important lessons Elmira learned in the United States. 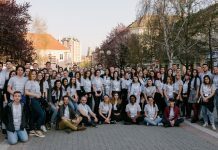 That is why Elmira dedicated her time and efforts to organize a camp to raise awareness about environmental issues in her community and incentivizes participants to create solutions and become social entrepreneurs. 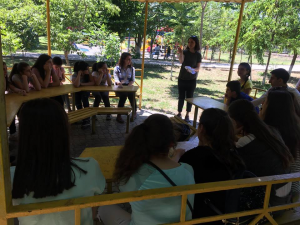 The participants of the camp learned how to design and manage projects focused on environment protection and the FLEX alumni and PCV teams will work with the participants to see the projects come to life across Armenia. 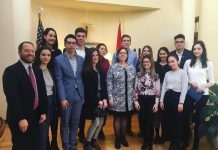 This project was provided in part by the FLEX Alumni Grants Program, which is funded by the Bureau of Educational and Cultural Affairs of the United States Department of State (ECA) and administered by the American Councils for International Education: ACTR/ACCELS.